Congratulations to the gang at Metblogs headquarters for successfully making the upgrade to the new look. I can’t even remember how many cities they had to convert over, but it was pulled off without a hitch. What is your impression of the new look? For you world affairs junkies, do make a visit to the Islamabad Metblog as they continue their live blogging coverage of the deadly clash between extremist Islamic students/members of Lal Masjid and Pakistani security forces. He was on the medical team of the first successful heart transplant using a baboon heart. His work was used by a team in South Africa that performed the first human heart transplant. My Dad was also the first surgeon to successfully perform a coronary artery bypass. My Dad lives like a rock star because his current wife is 28 (and he is 72), drives little Italian sports cars, and has four ex-wives. He also didn’t have me killed when, at the age of 14, I wrecked his BMW. My Step-Dad is a Rock Star because he doesn’t just take what life gives him and work with it, he tells life what he wants and works towards it. He is a hero in my eyes. My Dad is awesome because he is the most hard working, dedicated and intelligent man I know. He can make me and my brother laugh like no one else can and knows everything about pretty much everything – and that’s pretty darn cool. Posted in Metblog | Comments Off on Happy Father’s Day! The LA Metblog is doing some amazing reporting of the LA/Hollywood fire blazing on in Griffith Park right now. Do check out their timely/interesting anecdotes and photos – there’s some really cool stuff there. I’m not sure I’d be nearly so brave if there was a fire ravaging the world right next to my house, but then again you’ve got to be pretty damn balls-y to live in LA to begin with so there you go. One of the coolest things about the global Metblog family is the amazing diversity in cultures, backgrounds and perspectives we are made privy to thanks to our amazing authors. That’s why we are super proud of Mohammed Khan and the entire Lahore Metblogger community for opening a door into a country and climate completely different (and at the same time very similar in many ways) from our Houston world of BBQ, Hummers and heat waves. At times, Khan and Lahore’s other bloggers are openly critical of their government; some have even taken a stance against religious fundamentalists. Their writing is sometimes razor sharp, at other times meandering. In other words, they’re typical bloggers. What are some of your favorite Metblog sites? When is the last time you visited a new city to check up on their happenings, grumbles, inside jokes and coffee shop stories? The Berlin Metblog has made the heinous assertion that Berlin has the best street art in the world. The rest of the world disagrees and has challenged them to an International Street Art Contest. For the next two weeks, we’ll be taking submissions to a Flickr group called Metroblogging Streetart. Be sure to tag your photos with “houston” and “metblogs”. If Flickr isn’t your bag, you can email me your photos with location details and I’ll upload it for you (make sure you let me know if you want your name included or not), no worries. We’ll vote for the favorite Houston photos from April 18-25 and then the top 3 contenders will make the international round for global voting until we declare the Best Street Art in the World on May 3. Let me just say that this contest is not about you going out to vandalize something, but rather to document the street art and graffiti that already exists (and will continue to exist regardless of our little contest). Are you game? Start shooting and uploading your photos to the Metroblogging Streetart group! So this is my first in what I hope to be many MetroBlog posts. I decided to join in and do what I can to raise the city’s consciousness about cultural arts & local political hogwash in and around Houston. I’m an artist & native Houstonian who loves to hate on this city. It’s tough living here and you know it. However, the little treasures of Houston are worth my stay and I hope you feel the same way. Metblog meets Malaysia :: Welcome Kuala Lampur! Petronas Towers, Kuala Lampur, Malaysia, originally uploaded by mtbouchard. Home to nearly 2 million people and capital of Malaysia, Kuala Lampur is a beautiful ancient city bustling with cultural activity and a booming economy. Be sure to stop in and say hello! 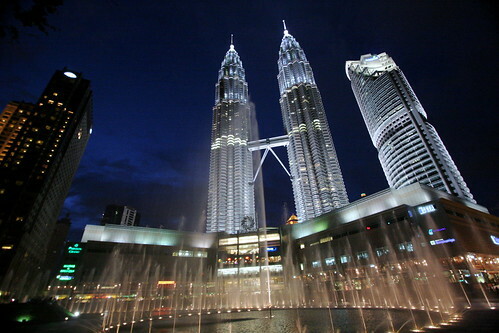 Posted in Metblog | Comments Off on Metblog meets Malaysia :: Welcome Kuala Lampur! If you randomly happen to be in Austin today – buy your SXSW music wrist bands! I just got the text message from SXSW. Waterloo Records (NW corner of 6th and Lamar) is selling SXSW wristbands as of right now. 2 per person. Cash or credit cards. Don’t kill anyone on the way down there. Check out the SXSW 2007 bands here. Some of the Houston Metblog kids will be attending the Interactive festival. Let us know if you’ll be there and we’ll drink beer together! Posted in Metblog, Music | Comments Off on If you randomly happen to be in Austin today – buy your SXSW music wrist bands! Metblog much? We want YOU to join the Metblog team! Do you want to be the coolest and most attractive kid on the block? Do you want to gain the admiration and respect of all of your extended family? Join the Houston Metblog and win prizes for your writing, virtual high fives for your most excellent wittiness and a minor celebrity status amongst Houston-area Metblog readers. Email Katie at happykatie at gmail dot com if you’d like to apply. We have a good time, write run-on sentences with reckless abandon and enjoy relating funny stories about our likes and hates in the city we live and love – Houston. Sign up today! Posted in Metblog | Comments Off on Metblog much? We want YOU to join the Metblog team!